Ukraine's president urged NATO to deploy naval ships to the Sea of Azov amid a standoff with Russia, a plea that was sharply criticized by the Kremlin on Thursday as a provocation that could further inflame tensions between the two countries. In an interview in the German daily Bild that was published Thursday, President Petro Poroshenko laid out his hope that NATO would "relocate naval ships to the Sea of Azov in order to assist Ukraine and provide security" against Russian President Vladimir Putin's expansionist ambitions. Kremlin spokesperson Dmitry Peskov said that Poroshenko's request is "clearly aimed at provoking further tensions" and driven by the Ukrainian leader's "electoral and domestic policy motives." 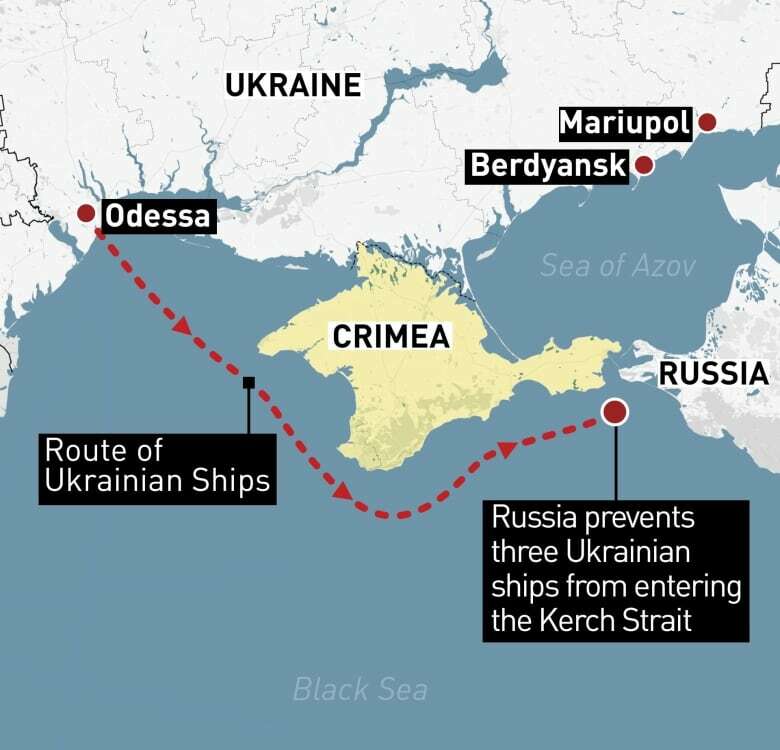 In Sunday's confrontation, the Russian coast guard fired on and seized three Ukrainian vessels and their crews that sought to pass from the Black Sea into the Sea of Azov through the Kerch Strait, between Russia's mainland and the Crimean Peninsula, which Russia annexed from Ukraine in 2014. Ukraine insisted its vessels were operating in line with international maritime rules. The Ukrainian government said Thursday that Russia has blocked commercial traffic to and from Ukrainian ports on the Sea of Azov, a claim Russia quickly denied. "Putin wants nothing less but to occupy the sea," Poroshenko told Bild. "The only language he understands is the unity of the Western world." Putin, for his part, criticized the West for what he described as connivance with Ukraine's "provocation." 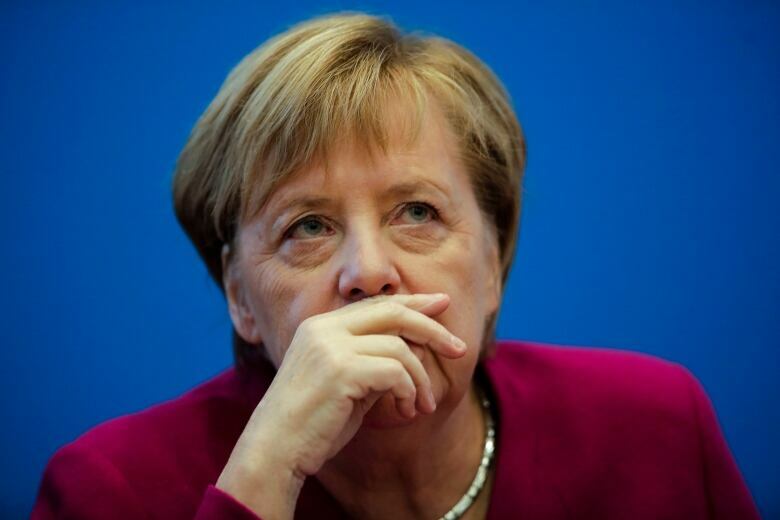 German Chancellor Angela Merkel said Thursday she plans to press Putin at this weekend's G20 summit in Argentina to urge the release of the ships and crews. U.S. President Donald Trump said Thursday he was cancelling a planned meeting with Putin at the G20 summit in Argentina because Moscow has not released the Ukrainian vessels and sailors it seized. NATO said it already has a strong presence in the Black Sea region. The alliance's spokesperson, Oana Lungescu, said NATO ships routinely patrol and exercise in the Black Sea, and that they have spent 120 days there this year compared to 80 in 2017. She said several NATO allies conduct air policing and reconnaissance flights in the region, noting that alliance members Bulgaria, Romania and Turkey border the Black Sea and have their own military equipment deployed. While NATO condemned the Russian action, the 29-member military alliance is not expected to send ships into the Sea of Azov, a deployment that could trigger a confrontation with Russia. A 2003 treaty between Russia and Ukraine stipulates that agreement from each of the two littoral countries is required for warships from any other country to enter the internal sea. Since Sunday's naval skirmish, Poroshenko has imposed martial law in much of the country, a move that went into effect with parliamentary approval. Putin accused his Ukrainian counterpart of provoking the naval incident as a pretext to introduce martial law in a bid to shore up his sagging popularity and sideline competitors ahead of the March election. 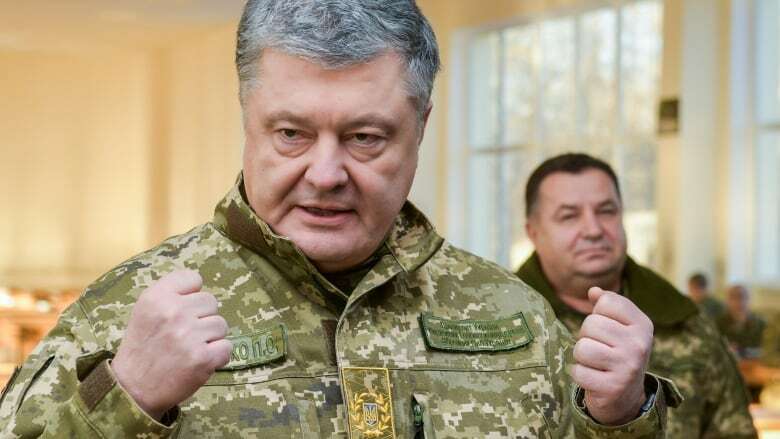 Poroshenko said that martial law wouldn't restrict travel, cash withdrawals or currency purchases by Ukrainians, but Russians in Ukraine will face certain constraints, which he did not specify. Ukraine's border service later said only Ukrainian citizens will be able to travel to Crimea for the next four weeks. The Ukrainian Ministry of Infrastructure said Russia has blocked 35 merchant ships from leaving or entering the Sea of Azov since Wednesday. Last weekend's clash marked the first overt collision between Russian and Ukrainian militaries since the 1991 collapse of the Soviet Union. It has fuelled fears of a wider conflict and has drawn strong criticism of Russia from the U.S. and its allies. Ukraine and Russia have been in a tug-of-war since Moscow's annexation of the Crimean Peninsula from Ukraine in 2014. Russia has also supported separatists in Ukraine's east with clandestine dispatches of troops and weapons. The fighting there has killed at least 10,000 people since 2014, but eased somewhat after a 2015 truce. The naval incident marked the first overt collision between Russian and Ukrainian militaries since the 1991 collapse of the Soviet Union. It has fuelled fears of a wider conflict and has drawn strong criticism of Russia from the U.S. and its allies. Amid the tensions, the Russian military said it had deployed another batch of the long-range, S-400 air defence missile systems to Crimea. Turkish President Recep Tayyip Erdogan said he discussed the possibility of a Turkish mediation to resolve tensions, and held separate telephone conversations with Putin and Poroshenko on Thursday. Asked about the Turkish offer, Peskov responded that "Moscow is grateful to all those willing to help de-escalate the tensions provoked by the Ukrainian side, but doesn't see any need for mediation efforts." "Those who have such opportunities could help by exerting influence on the Ukrainian authorities," Peskov said.